Mrs. Hoffay has been a life-long resident of Wynantskill. She was baptized at St. Jude the Apostle Church and her family still attends church at our parish. While attending Gardner Dickinson Elementary School, Mrs. Hoffay played CYO basketball and was a member of the cheer squad for St. Jude’s. She also enjoyed playing softball in the community as a Classie Lassie for 10 years. Mrs. Hoffay went on to attend high school at Troy High. At that time, Mrs. Hoffay gave back to her community and the town of North Greenbush by becoming a camp counselor for the Town of North Greenbush day camp, and later taking on the role of assistant camp director. Mrs. Hoffay earned her Bachelors degree in Elementary Education at SUNY Oneonta. After graduating, she spent 1 year substitute teaching in local public school districts before being hired at St. Jude the Apostle School as the 2nd grade teacher. On her summers off, Mrs. Hoffay attended University at Albany to earn her Masters degree in Reading. Mrs. Hoffay is a certified reading specialist for grades K-12. After spending 10 years as the 2nd grade teacher Mrs. Hoffay requested a move to the 3rd grade for the 2009/2010 school year. In addition to her classroom responsibilities, Mrs. Hoffay also coordinated the sacramental preparation for the 2nd grade children, including First Reconciliation and First Eucharist. Mrs. Hoffay also volunteers as the faculty advisor/coach the K-2 and 3-6 bowling teams. 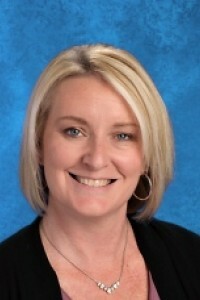 Mrs. Hoffay was also nominated and chosen as a Troy Record Teacher of the Year in 2001. In 2011, Mrs. Hoffay received the Elizabeth Anne Seton Distinguished Teacher Award through the Albany Diocese. It’s hard to believe, but the 2017/2018 third grade class will be Mrs. Hoffay’s 20th class!